Co-founder of Eumatech, a firm specialising in the publishing, distribution and integration of software solutions dedicated to supply chain and interfaces between information systems, Malik Touimi Benjelloun founded a first startup in Paris in 2000 specialising in the purchase of intellectual services after having been Director of Internet Marketing and New Technologies at a subsidiary of the BNP Paribas group. Following the sale of his shares in this Parisian start-up, he returned to Morocco in 2002 to Casablanca. 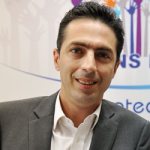 Mr. Touimi was able to diversify his business by creating a new firm in 2005 specializing in Head Hunting Managers, which carried out more than 1000 recruitment missions between 2005 and 2016. Mr. Touimi Benjelloun graduated from Paris IX Dauphine in Financial Management and has a DESS in Risk Management and Financial Instruments from the IAE of Aix-en-Provence.